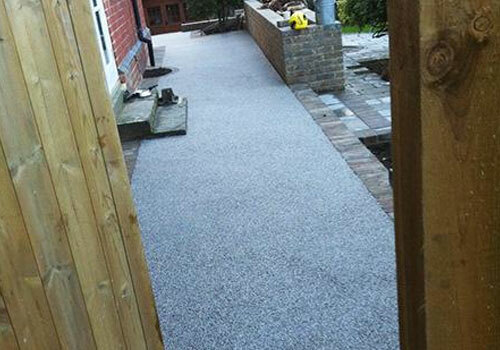 Thornbury Surfacing install beautiful resin gravel surfaces perfect for driveways, patios, paths and car parks. 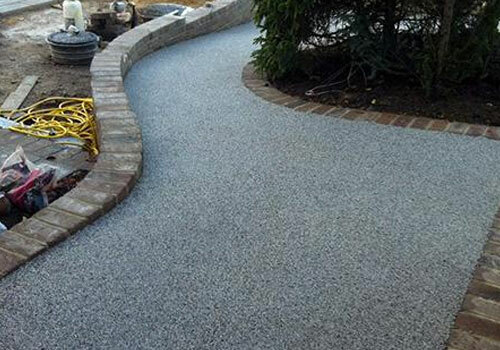 With the Resin Bonded Gravel system, resin is spread over the surface using a serrated squeegee, before gravel is evenly distributed over the top and allowed to set into the resin. 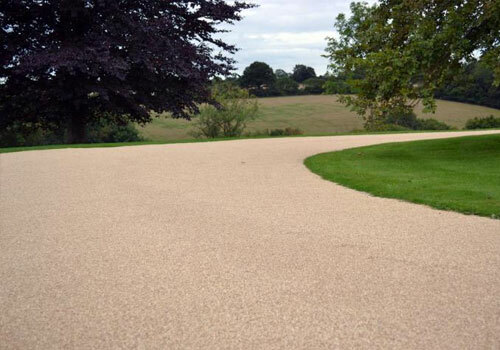 The depth of the Resin Bonded Gravel surface is determined by the size of the aggregate used, and is typically 3mm. A decorative and natural appearance which comes in a range of colours to match the look of any other surfaces in the area. The rough textured finish provides anti-slip qualities which are perfect for slopes and public walkways. Withstands heavy use from vehicular traffic and is durable against weathering. Resin bonded paving doesn’t lose particles of stone or get washed away during wet weather. A resilient paving system with a life expectancy of up to 15 years. 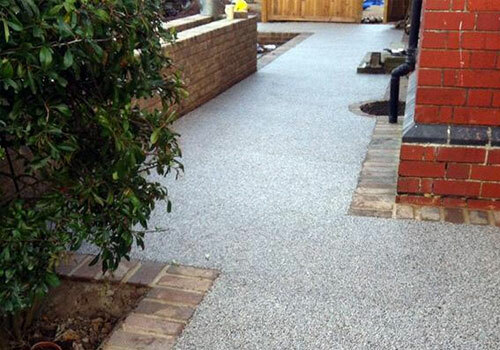 Drystone resin bound surfacing is comprised of graded aggregates, bound with a clear polyurethane resin binder, which allows the aggregate colour to show through. It is based upon BS 4987 (the British Standard specification for coated macadam’s) with bitumen replaced by a clear binder and is designed for driveways, mews, parking areas or where the application of hot applied may not be feasible. 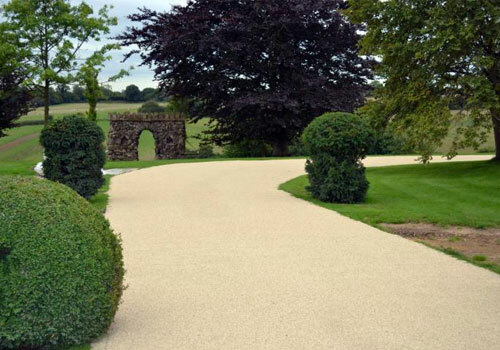 Drystone resin bound surfacing provides a hard-wearing textured surface, resistant to the weathering effect of UV radiation from sunlight and to softening or degradation by oils, fuels and some commonly used solvents. 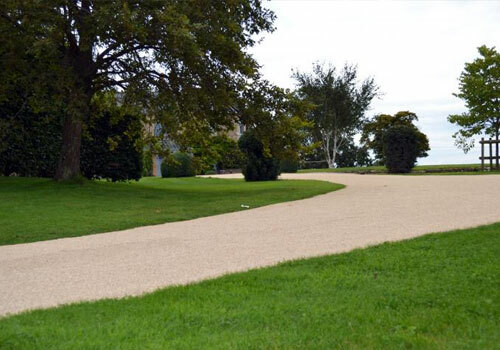 The durability of Drystone resin bound surfacing will depend on site conditions and it is anticipated that the surface will have a similar service life to that of conventional bituminous macadam made with the same aggregate. Drystone resin bound surfacing aggregate and binder system is mixed on site immediately prior to laying in a forced action mixer, mixing the aggregate and resin together. The mixed material is laid to a depth of 15-18mm on bituminous or concrete base courses and float finished. The depth and composition of the underlying construction will be dependent on whether the surfacing is intended for vehicular or pedestrian traffic. The curing time of the surfacing is controlled to suit the prevailing site conditions by the incorporation of additives at the mixing stage.